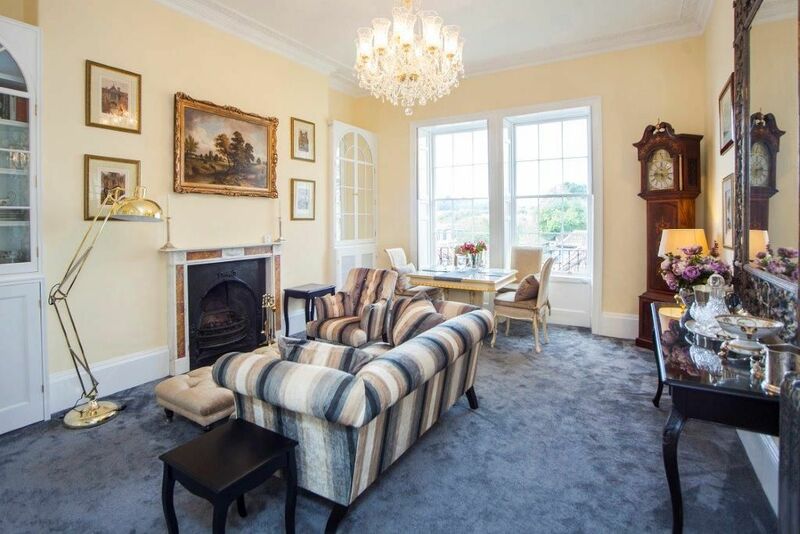 Live like royalty at this little palace for 2 in central Bath. 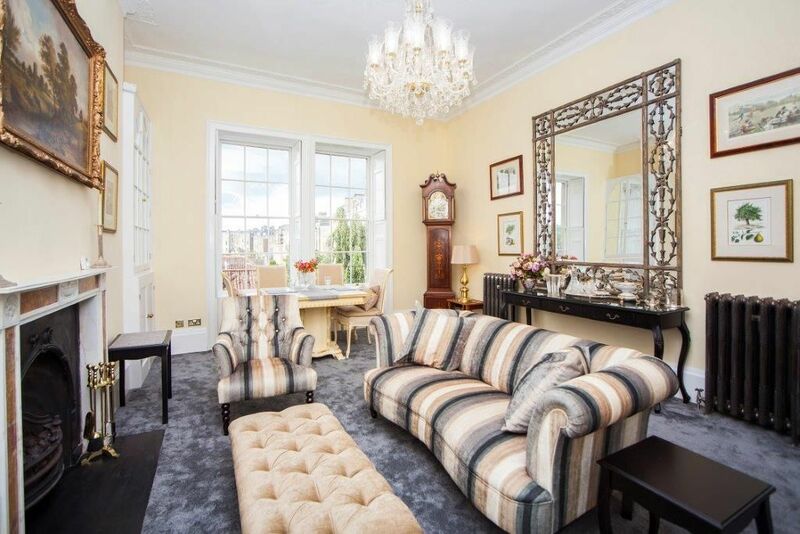 An indulgent first floor, one bedroom property, with glamorous decor, lavish furnishings and such handsome Georgian proportions, you will never want the clock to strike midnight in this lovely historic city. A smart entrance and lobby area leads you to beautifully appointed rooms, rich with period detail. 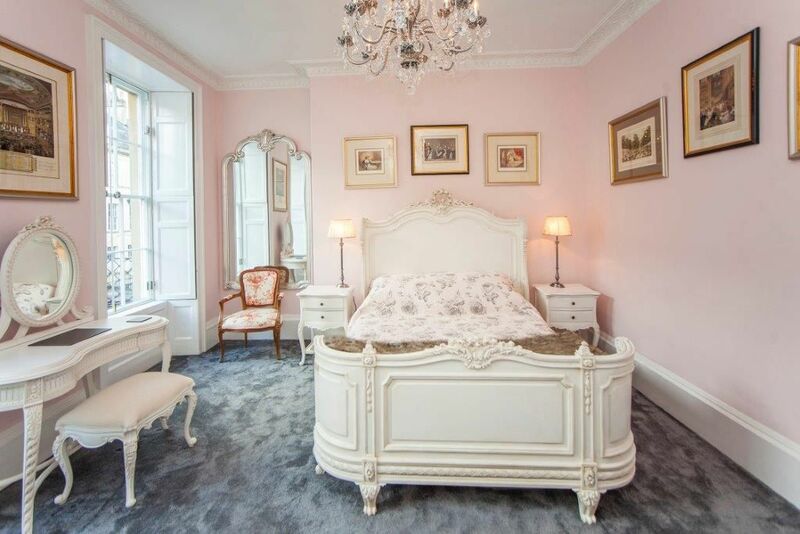 High ceilings, ornate cornicing, lustrous chandeliers and original sash windows give the rooms elegance and panache. 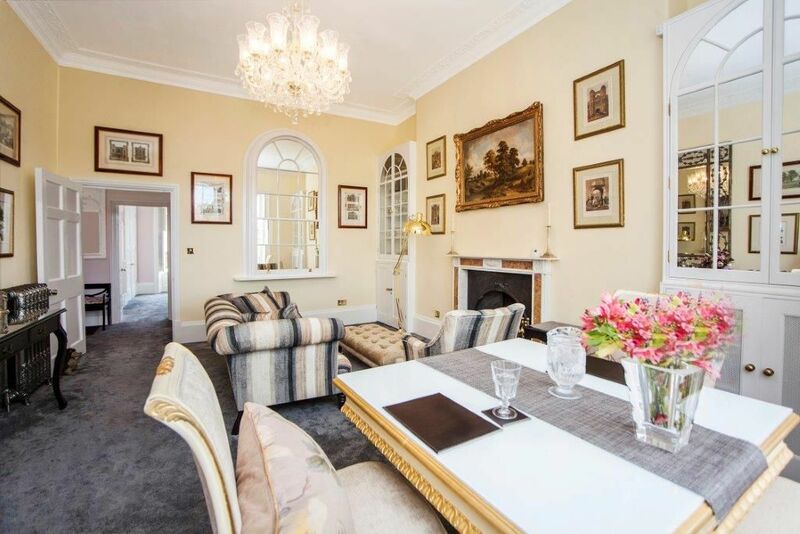 The luxurious living and dining room has a carved marble decorative fireplace. 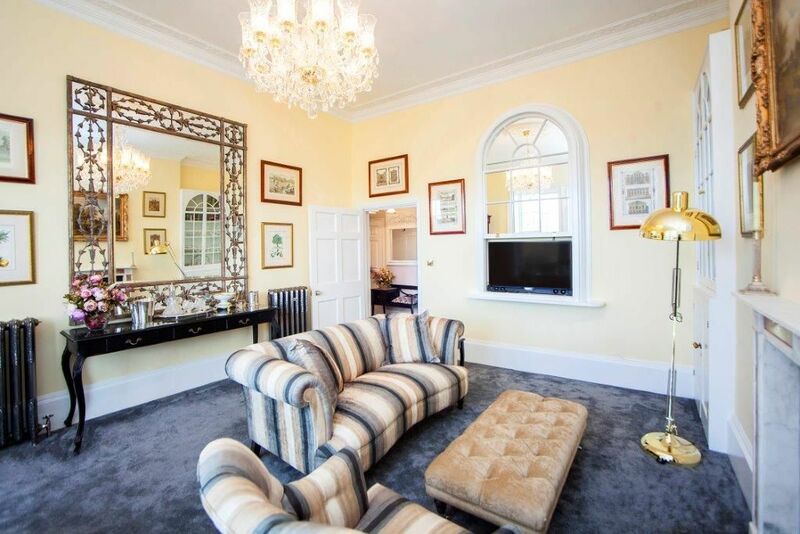 Large alcoves either side have bespoke display cabinets stacked with china and crystal, books and games. The TV, elegantly concealed behind a sliding sash mirrored window, has a Bluetooth sound-bar. There is a sofa for 2 with a lavish fur throw and a comfortable armchair alongside. Under a grand mirror reflecting a twinkling chandelier, is an elegant console set up for evening drinks or champagne, an antique grandfather clock will inform you of the cocktail hour. 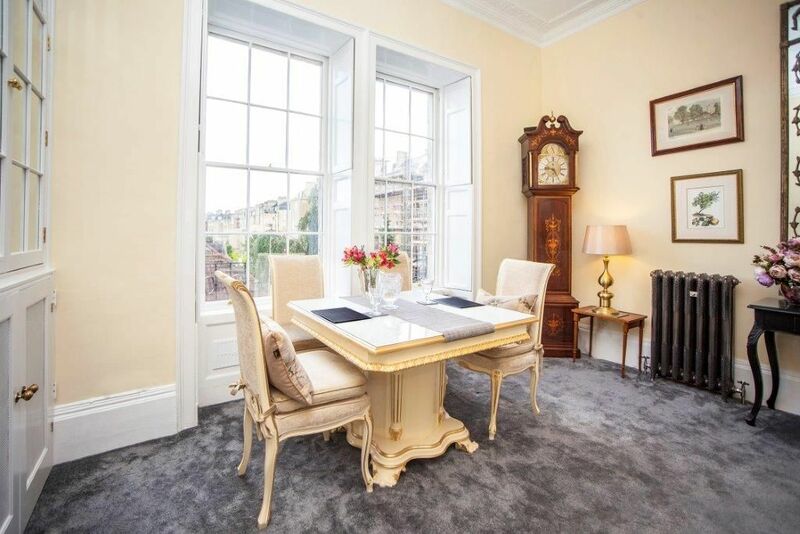 Beside the two large sash windows is a large square cream and gold dining table and comfortable seating for 4. 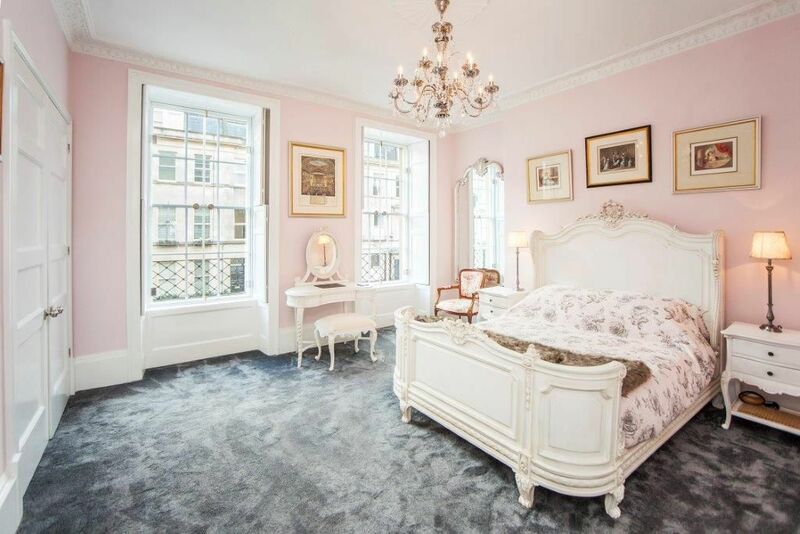 A spacious bedroom has elegant antique French style furniture, including an ornate carved 5’ bed and a dressing table with stool. There is a fine silver chandelier and lots of pretty framed prints of Georgian scenes. 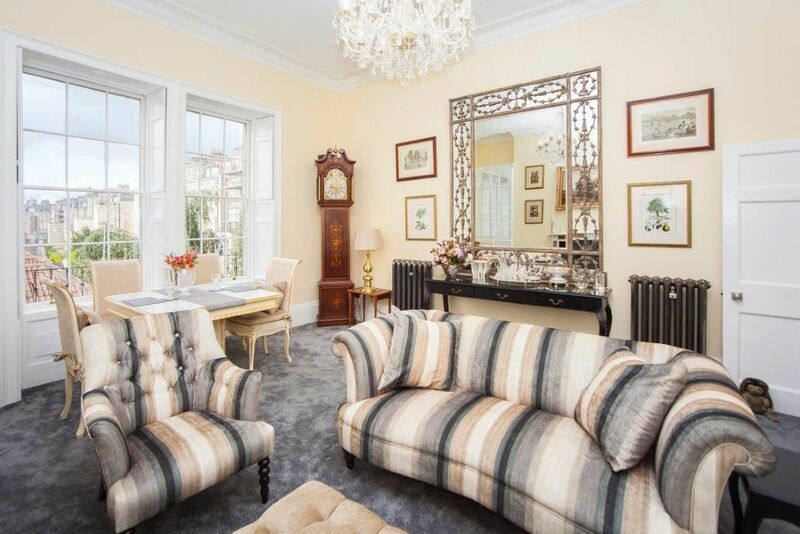 A large built-in wardrobe provides plenty of hanging and storage space whilst two tall sash windows with working shutters, overlook a grand Georgian terrace opposite. 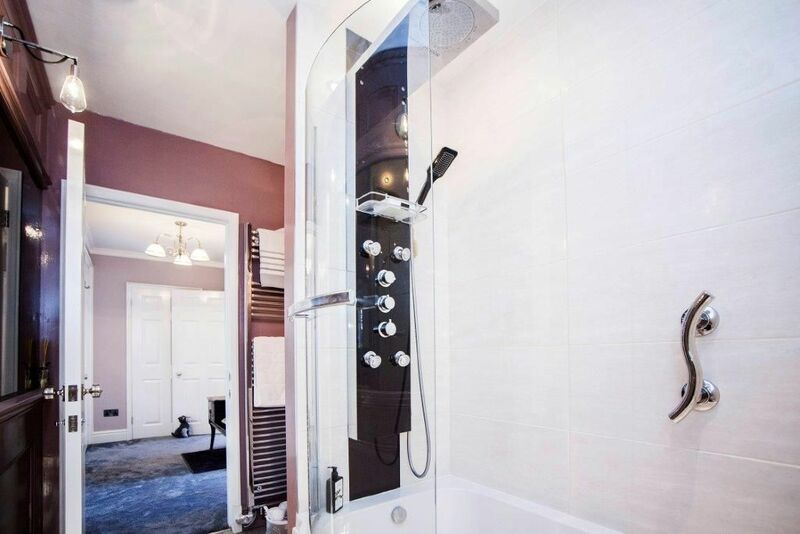 There is an indulgent contemporary bathroom with a large bath that also includes a shower area with massage jets and an overhead rain-fall shower. There is also a large hand-basin with storage under and a WC. A smart galley-style fitted kitchen in cream with dark granite tops, provides plenty of cooking equipment, fine china and cupboard space. 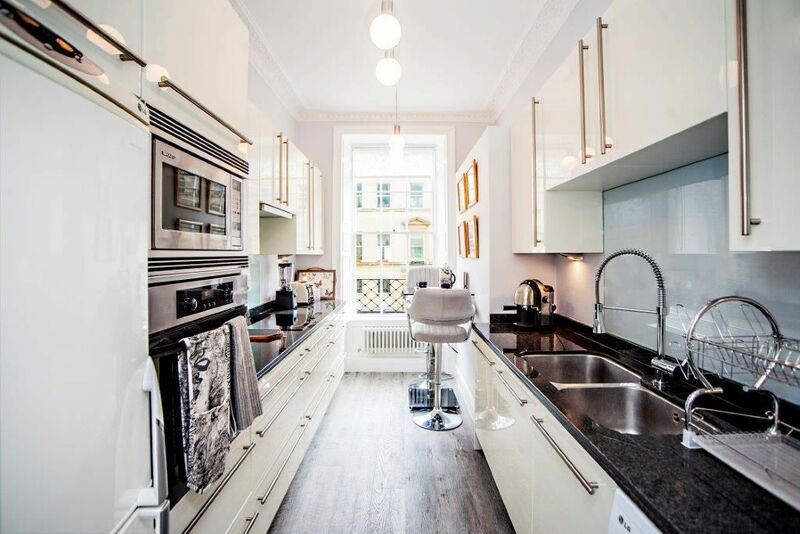 Besides a vast sash window, you can linger over coffee at a chic breakfast bar area with 2 comfortable stools. The equipment includes an induction hob, an electric oven and microwave, a dishwasher, large fridge and separate freezer, a Morphy Richards coffee machine and coffee grinder. 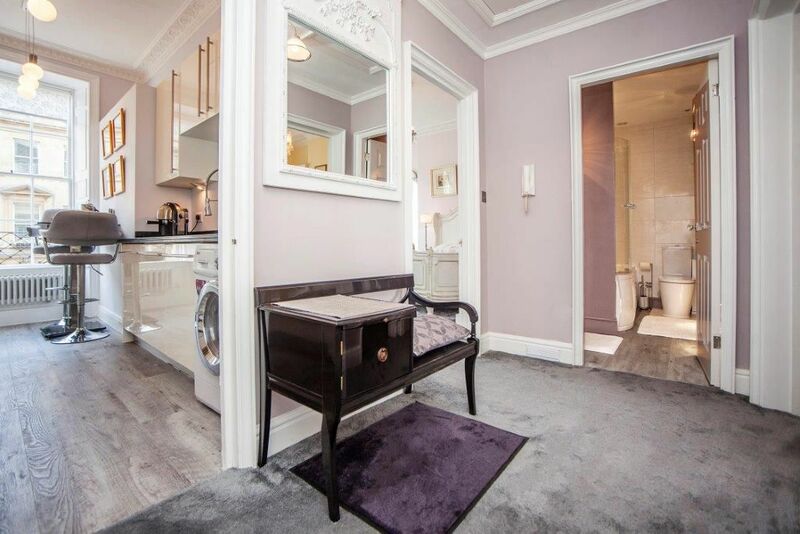 There is also a combined washing machine and dryer, with further utility items housed in a coat cupboard in the lobby. 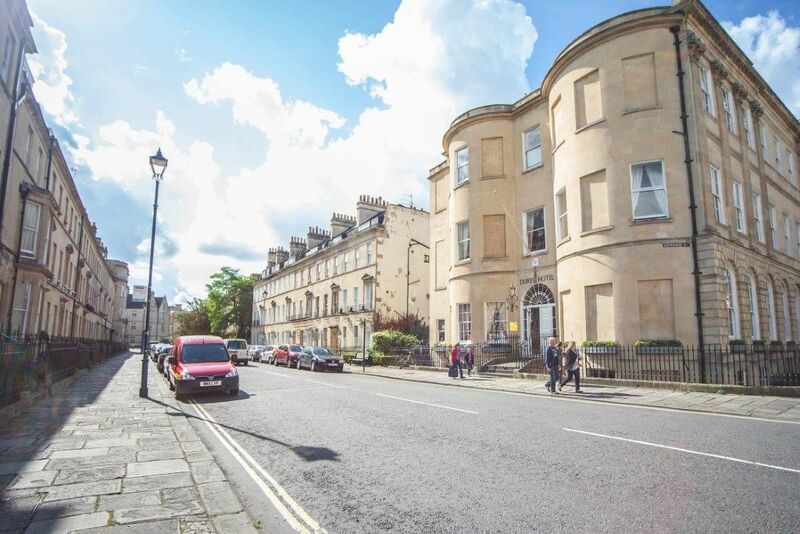 The apartment has a great central location and Bath has many beautiful historic sites, wonderful museums and galleries, good restaurants, lively bars, great entertainment and absolutely gorgeous shops and all within a short level walk. 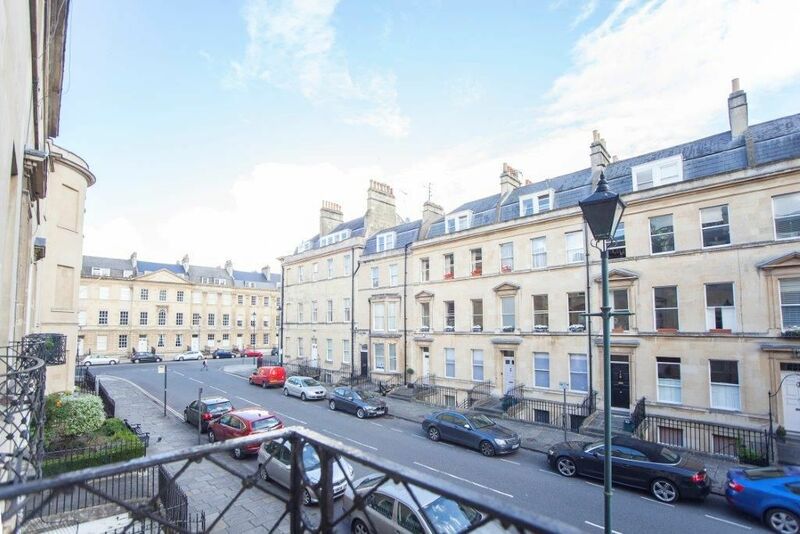 Edward Street is just off the world famous Great Pulteney Street, boasting fantastic Georgian architecture. The Holborne Museum is around the corner which also features a lovely restaurant and coffee house set within the beautiful Sydney Gardens. 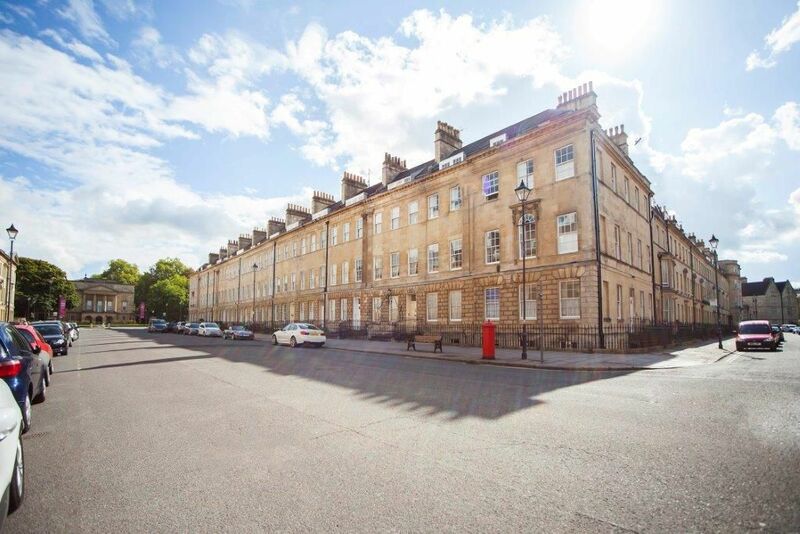 You can play tennis on the public courts in Sydney Gardens or walk/bike along the scenic canal towpath for lovely views of Bath. 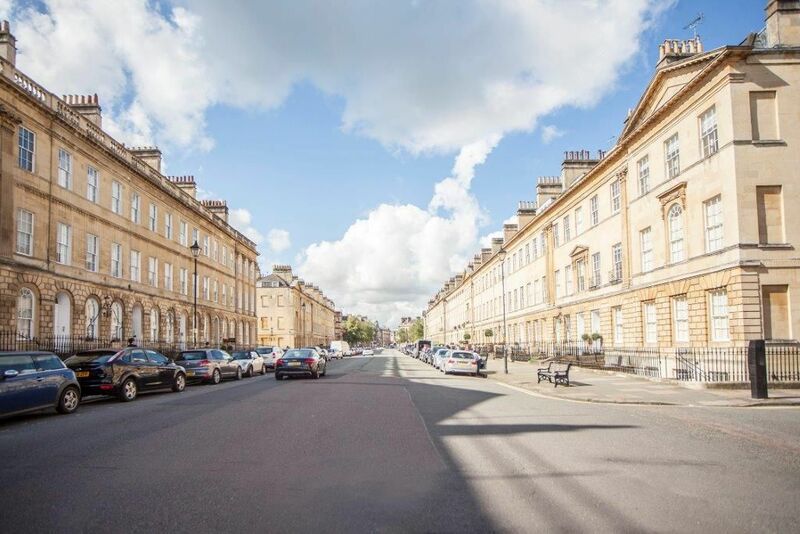 With the city centre just a five minute level walk away you can see a show at the Theatre Royal, enjoy an evening at Komedia comedy club or a soothing session at the Thermae Spa. 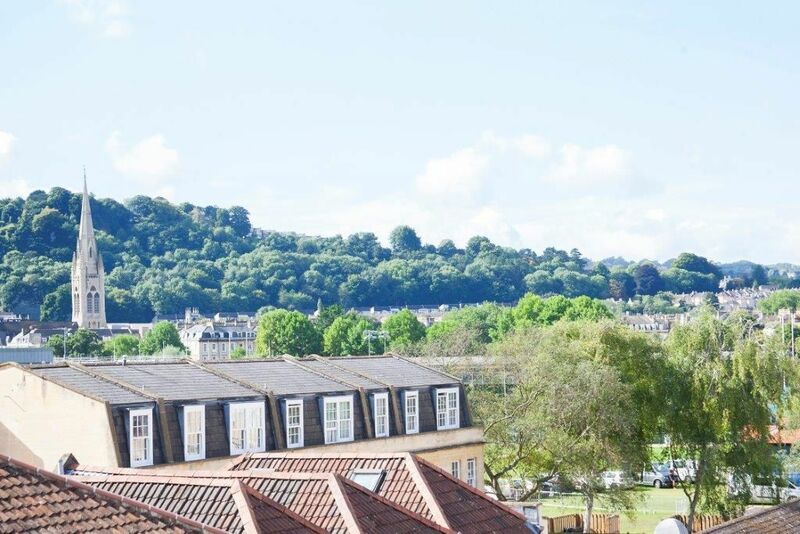 You can also take advantage of proximity to The Rec, home of Bath Rugby with the season running from September to May and matches every two weeks. Telephone the Box Office outside the grounds on 0871 721 1865 to book tickets up to 4 weeks in advance or visit www.seatexchange.co.uk for online tickets. Waitrose supermarket is also a level 5 minute walk away. 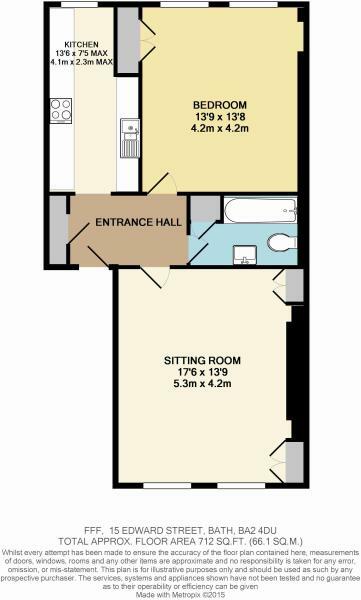 This first floor flat has everything you can ask for! The decor is gorgeous and all the amenities are included. The bath and kitchen are modern. The bed is extremely comfortable. 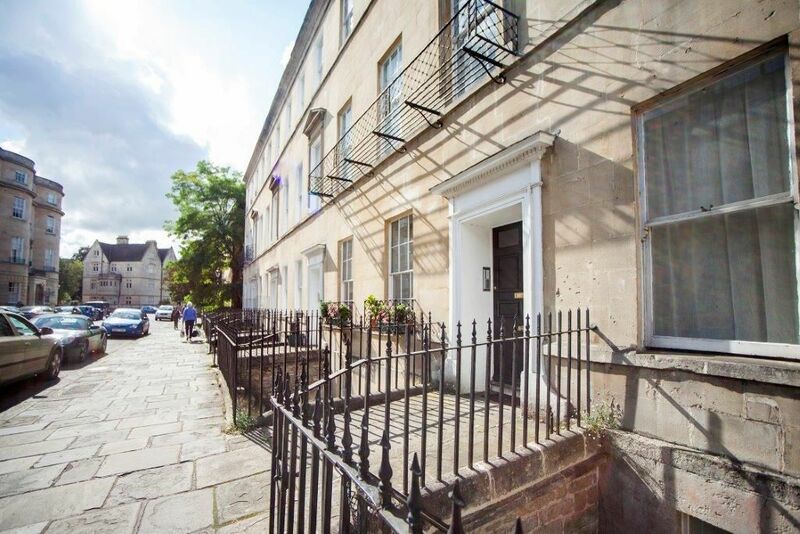 The plus is you can walk right into the heart of Bath. We very much enjoyed our stay in the Edward Street apartment. From making the arrangements, to arriving and being greeted, and right through our stay, everything was perfect. We enjoyed the supplies left for our use, the coffee, wine, cereal and milk, all a great touch to enhance our enjoyment. Stayed in a marvelous apartment (Edward Street Apartment) for 5 nights in March 2018. Fantastic break - will certainly be back in Bath and won't hesitate to use Bath Holiday Rentals again. 1st class accommodation in excellent location The standard of accommodation is very high. Wonderfully furnished. Great locality. 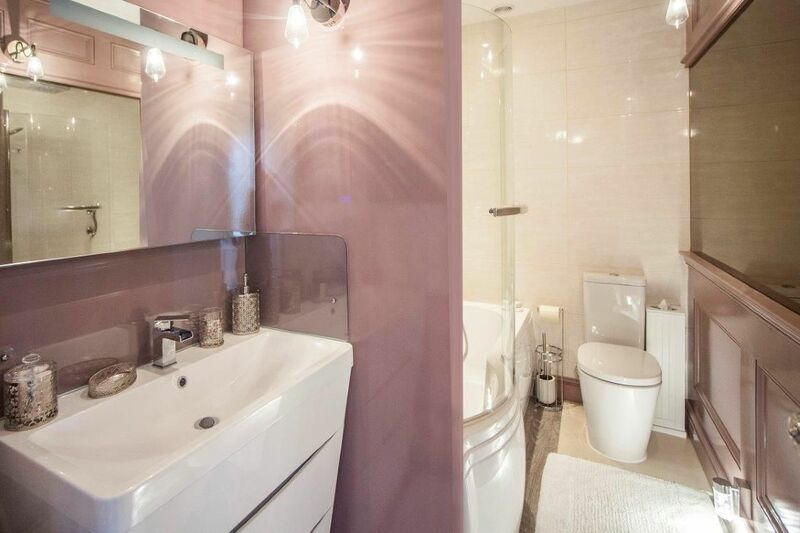 Close to the city, yet in a quiet upmarket residential area. Would not hesitate to revisit this property. 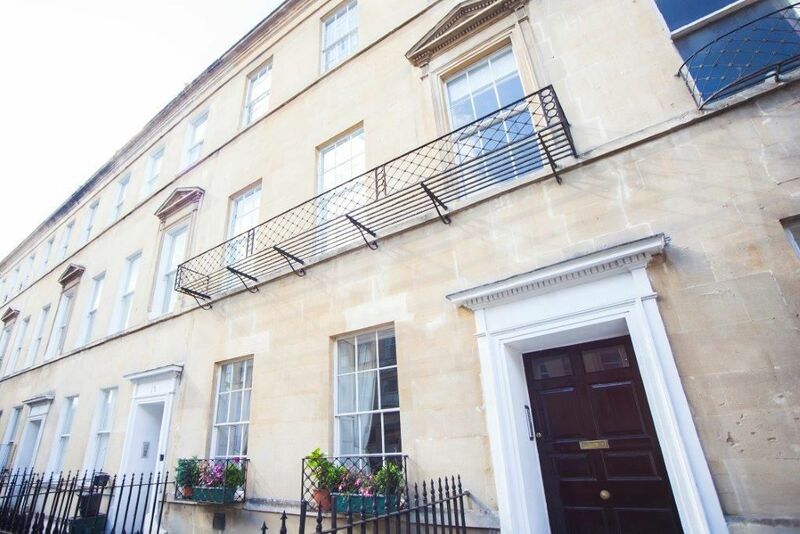 The company (Bath Holiday Rentals) were very professional in everything they did for us and can be thoroughly recommended. Just a note to say how much we enjoyed our visit to Bath. 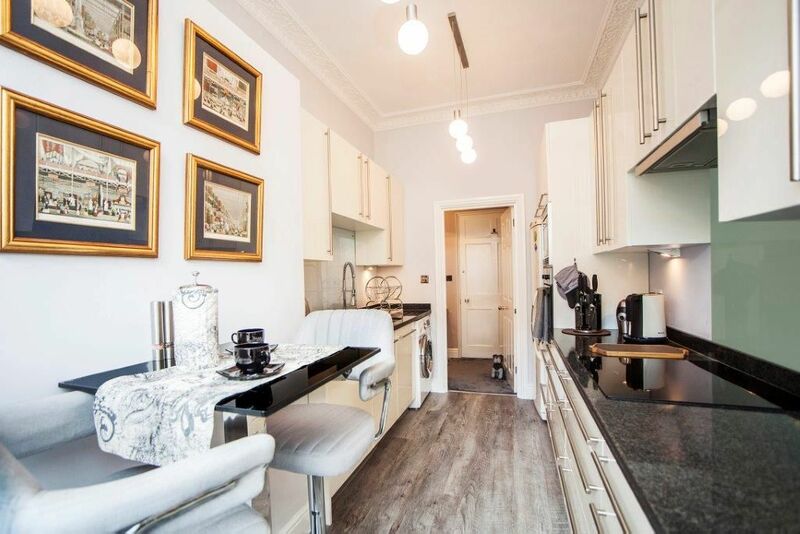 The Edward Street Apartment is stunning and has everything you could want and it is in a fantastic location. We will certainly recommend it to others. We stayed at this apartment for a weekend break. It was lovely. Ideal location and yes we managed to park the car in Zone one. This is our third booking with Bath Holiday Rentals so can highly recommend - great team and very efficient. My husband and I felt very special to discover that we were the first guests to stay at the Edward Street apartment in September 2017, and we loved it so much, that we booked for a second stay later in that month. The apartment is amazing, and we would like to thank the owners for sharing it with us. 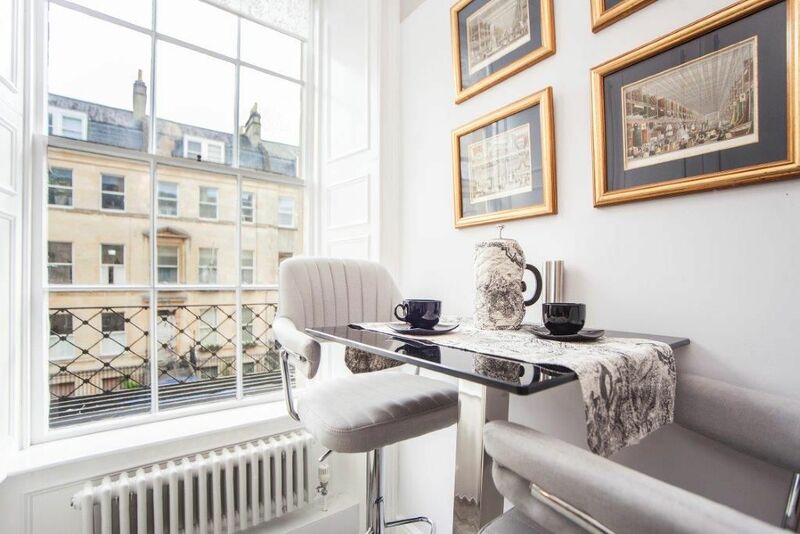 The attention to detail, that runs through all of the Bath Holiday Rental apartments which we have enjoyed over recent years when we visit Bath, continues on in Edward Street. 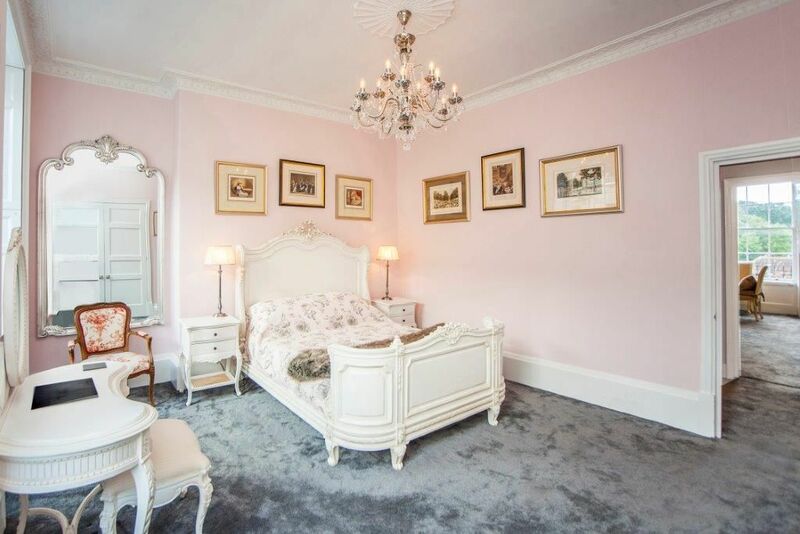 However, the beautiful soft carpet after a long day on your feet, then resting weary bodies and looking up at the amazing chandeliers in both the bedroom and living room, not to mention all the other wonderful surroundings and incredible decor just can't be described !!!!! 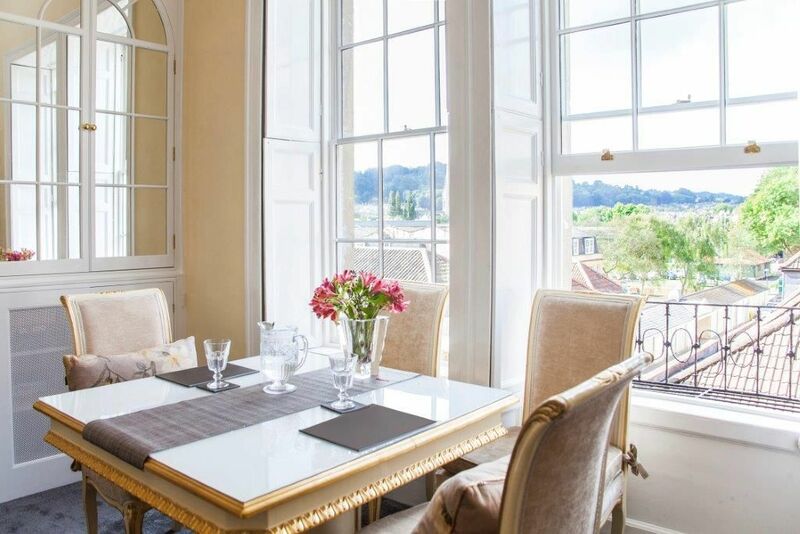 We can't wait to visit Bath again next year and hope that this beautiful apartment will be available for us when we do. This property is new as of September 2017. A review of this property will be much apprciated!